Lives: Basra History: Hassan Juma’a Awad is General Secretary of Iraq’s largest independent company. He represents around 30,000 workers across 10 unions in Nassiriyah, Amara, Maysan, Thi Qar and Basra. His recent solidarity tour aimed to raise awareness of Iraq’s reconstruction successes and push past the stigmas of conflict. Looking exasperated, Hassan Juma’a Awad raises his brown eyes, folds his heavy hands together, and shrugs. On either side of him his translators bicker, wave their arms in die air frantically and contradict one other. He shrugs again and half smiles. As a trade unionist Awad is used to struggle. As an Iraqi, he’s seen a lot worse than this. 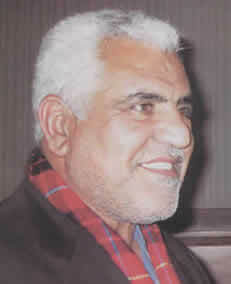 Awad is the president of the General Union of Oil Employees in Basra, an independent trade union that has fought for workers’ rights since the fall of Saddam’s Ba’ath Party. He is in the UK to meet British trade unionists and, as I speak to him, he is on the last leg of his trip; a lightning quick tour of Caledonia that includes a meeting with OilC -Scotland’s own radical union for oil workers. The translators – one Palestinian, one British – keep battling over his words. At first they tell me he means one thing, then it changes into another. Bloodshed is mentioned but then, proverbially at least, the streets are swept clean in front of me. Awad rarely joins in. He speaks (passionately 1 think but it’s hard to tell without understanding Arabic), dien settles back to listen, his eyes shuttling between the translators, his bearing dignified if frustrated. The men he represents have already scored an important victory. The Southern Oil Company Trade Union defeated the occupation’s administration, then under American Special Envoy Paul Bremer, in a battle over pay. The workers, unhappy with wage structures set by the administration, direatened to “shut down Iraq from north to south” by going on armed strike if their pay demands weren’t met. The threat succeeded in raising the lowest wages of oil workers in the South from 69,000 Iraqi Dinar per month to 102,000 per month. Under Saddam, trade unions were little more than a front for state-sponsored oppression. They were a convenient tool for monitoring; a perverse inversion of what they should be for. Trust, therefore, is a crucial issue. Those who lived under the Ba’adi dictatorship instinctively, and understandably, mistrust diose who claim to represent them. So rebuilding the workers’ faith in collective action is a tougher job than most. But there is still a lot to leam, Awad explains. And that is why he is here. He hopes to soak up hundreds of years of British trade union history and experience and take the lessons back to Iraq where he can put them to invaluable use. He says the way the invasion turned into an occupation frustrated and disappointed him. Before any real change can happen, he argues, die occupation troops have to leave the country. The Iraqis are ready to manage their own affairs, he says, and even through die mild-mannered translator, he is blunt and determined. He says the elections which took place at the end of January are key. “If diey are to bring any kind of success they will have to stop the occupation and get the troops to leave the country. Secondly, the Iraqi authorities have to make sure the coalition countries have no further influence over government. After we’ve finished die interview Awad is due to speak at a political meeting. He seems slighdy nervous about it. Although his trip to Britain has been worthwhile, he has been frustrated by conversations that have drifted away from the practical, nitty-gritty of trade union organisation, towards larger political questions that make him uncomfortable. He is not here to speak about those things. He has, however, been heartened by the reception he’s received from the British people, especially the young. He tells me about an article written by Iraq’s oil minister for Shell’s in-house magazine. The minister said 2005 would be the year for “greater dialogue” with western oil companies. Awad shakes his head; he never would have seen it if a group of young campaigners hadn’t pointed it out to him. The experience will be part of the message he takes back to Iraq with him. By now, the translators have learned to agree on what Awad is really saying. They work as a team, one translating through one point, tiien the other chipping in for the next. Awad seems to enjoy the relative peace and quiet this new teamwork creates. For Awad to be successful he will need all the conflict resolution experience he can get. But for now, with the interview finished and everything settled, he stands up, shakes my hand and says thank you in English. His accent is as gravely and determined as I thought it would be. Graham Meldrum Memorial Campaign HARD WORK NEVER KILLED ANYONE..? announce the start of the Fatal Accident Inquiry (FAI) into the death of Graham Meldrum – 17th March at Glasgow Sheriff Court. Prior to the inquiry there will be a vigil outside the Sheriff Court for Graham and all other workers killed for profit. Organised by the Campaign we hope that TRUTH, JUSTICE, RESPONSIBILITY AND HUMANITY will be present at the F.A.I. The FAI will look into the circumstances of the death of Graham Meldrum and the manner in which the subsequent prosecution of some of the companies responsible was dealt with. Graham, 40 years of age, was killed in an incident at work on the 12th of July 2005 at Allied Bakeries on the Balmore Industrial estate in Glasgow. Graham was killed while unloading a bread delivery truck that had a faulty tail lift, leaving behind a grieving partner, children and elderly parents. After a two years wait for action to be taken by the authorities Grahams family and friends took matters into their own hands and started proactively campaigning to have the companies responsible prosecuted. Following many letters, phone calls and a number of public demonstrations the case eventually came to court. A series of trial dates were set at which the family attended only for them to be postponed for the convenience of the companies and to the further distress of the family. Eventually on 5th Nov 07 at Glasgow Sheriff court two companies, ABF Grains (Allied Bakeries) and TNT Logistics were eventually found guilty of various breaches of Health and Safety legislation in relation to Graham’s death. The two companies were fined a paltry £19500 and £14000 respectively. A third company, Suzyline, the agency for which Graham was a contract driver, escaped prosecution. delays to bring this to a F.a.i. This comes in the wake of recents announcements by Kenny Macaskill, justice minister that a major overhall and investigation fronted by Lord Cullen will take place in the near furure. Grahams partner, Karen, and family and friends will attend the FAI and invite members of the media to publicise the facts of this case and outcome of the FAI.